Malaysian Ringgit currency has dropped tragically. Thus, we were going to have some VALUE FOR MONEY meal, which is delicious and with quality. 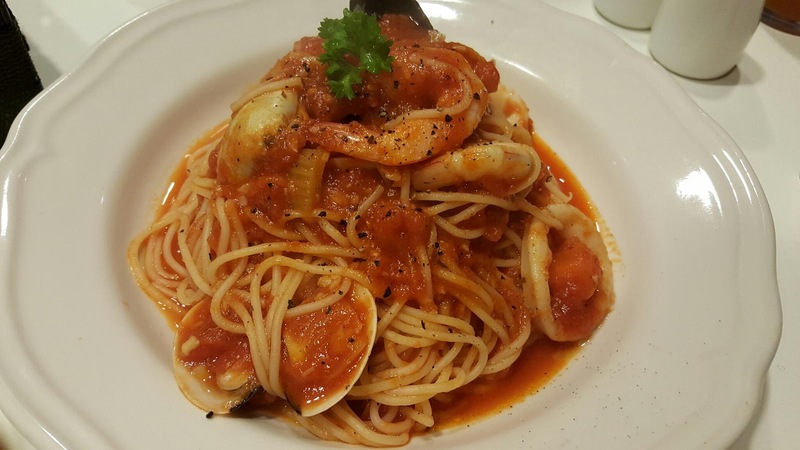 Last Saturday, Kenny wanted to eat his favourite pasta at Pommes Frites Bistro @ Sunway Pyramid. It was located at Asian Avenue, the food street! Pommes Frites is located at Asian Avenue of Sunway Pyramid. It serves Pasta, Belgian Fries, Mussels and Snacks. 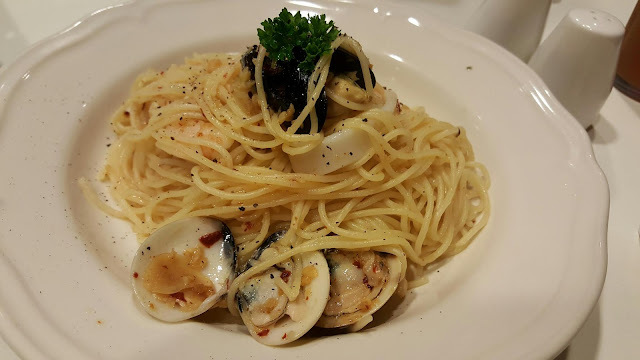 Seafood Aglio Olio (RM12.90). Big portion and generous amount of fresh seafood. Spaghetti was lightly sautéed by minced garlic, chilli flakes and olive oil, it's springy and garlicly fragrant when you were eating it. The seafood (mussels, clams, squids and prawn) was fresh and seasoned well. Spaghetti Marinara (RM12.90). Thumb up. Marinara sauce was awesome, cooked tomatoes, onions and carrot cubes were soft, perfect sour taste and it's more to soup based, my favorite. Seafood (Clams, squids, mussel and prawns) was well cooked and fresh, taste good together with the sauce. Can you see the medium size of prawn on top of the spaghetti? Definitely worth the price we paid. Devil Chicken Spaghetti (RM 15.90). Generous portion of smells great spaghetti which was sautéed by minced garlic, chilli flakes and herbs, topped with chicken chop. 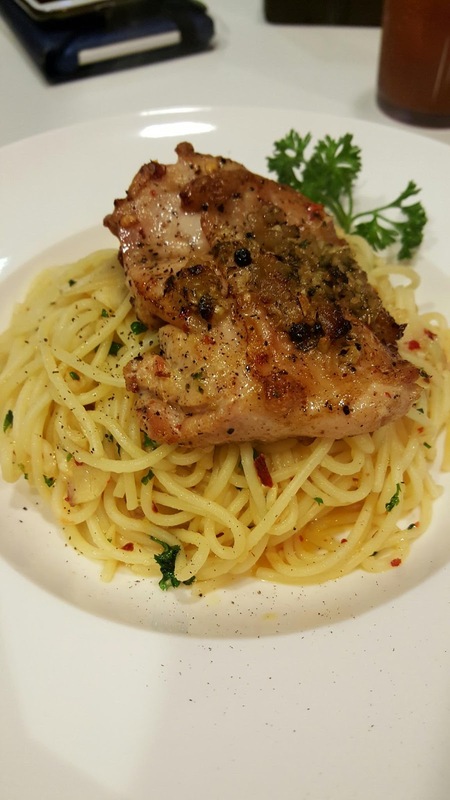 The chicken chop was tasty and tenderly cooked with minced garlic and herbs. Delicious! The environment is okay, stalls with limited table and seats, not convenience to serve larger group. Update on my last visit on 4th September'15, I decided to try something new - Salmon Carbonara Fettuccini while Kenny ordered Seafood Marinara. 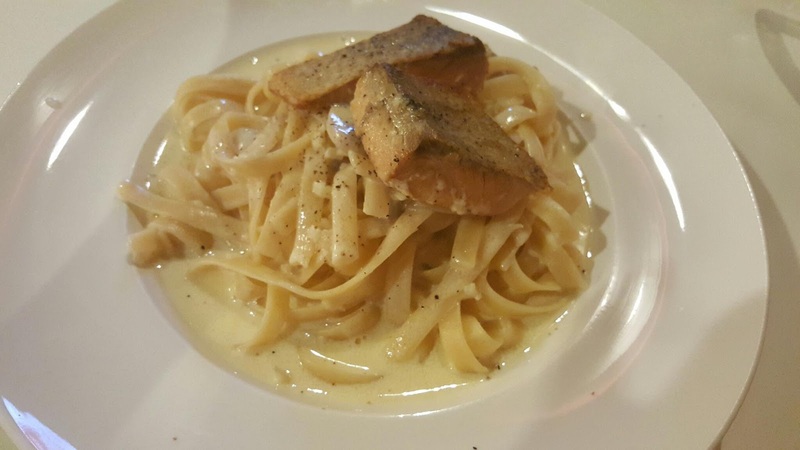 Salmon Carbonara Fettuccini (RM 15.90). Fettuccini and Carbonara sauce was good, slightly cheesy savoury and not too creamy, my personal preference style. LOL. While 2 pieces salmon fillet taste a little bit odd, perhaps the way they marinated it or it's freshness matter. We paid our visit frequently, almost once per week. It's the first time we encountered their seafood freshness matters and Kenny did feedback this matter to staff and they said will take note about this matter. Time to watch The Transporter- Refueled after fulfilled our stomach. 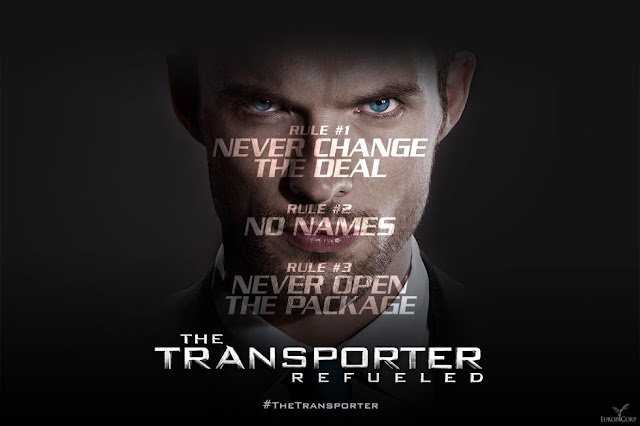 This time The Transporter movie didn't focus much on high tech unbeatable powerful reboot black armored Audi A8 W12 Handsome but more into bloody martial arts sequence. Not to forget to mention that Ed Skrein is so handsome! !